After dropping points against Newcastle, Manchester City received some help from West Ham United. The 1-1 draw between Pellegrini’s men and Liverpool was a wave of relief to Pep Guardiola, who saw his chances of a second consecutive Premier League title stay intact. Everton, had who lost four of the five last games, wanted to keep their chances of reaching a Europa League spot. 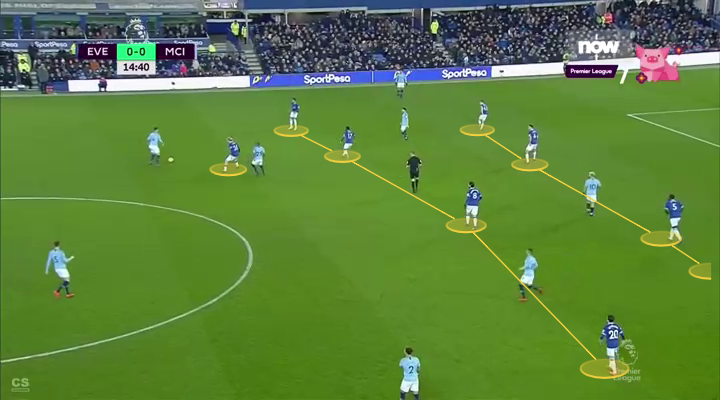 In this tactical analysis we see how each team changed their tactical approach compared to their last encounter in December 2018, but a goal in added time of each half gave the three points to Manchester City. If there is one word to define the first half of the game, it is intensity. It was not the most beautiful game with few chances for either team, but the intensity level was very high. Both teams played a very vertical game, with direct passing and fervent pressure. This resulted in a high number of turnovers in possession and a good amount of time spent in the middle third of the pitch. Last time they met it was a strange game. 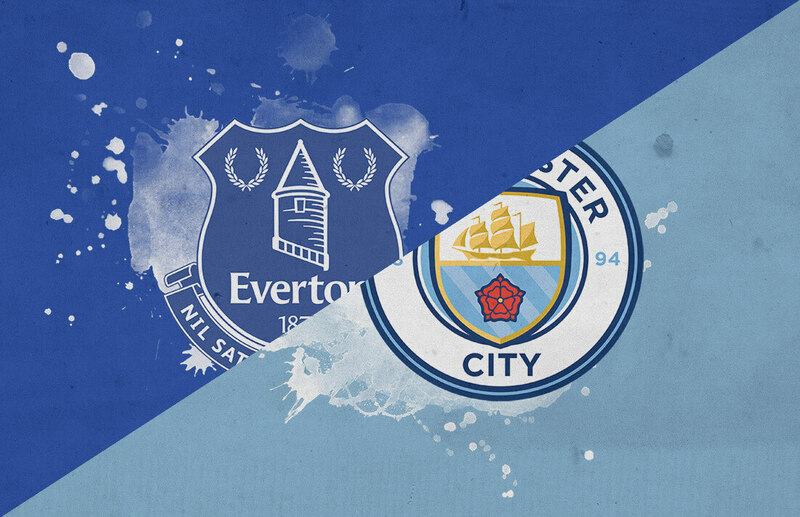 A relatively easy win for Manchester City contained few but very clear chances generated by Everton, although most of the game was spent with Manchester City in possession and Everton on the back foot. Both teams tried to adapt from that last game, with Guardiola deploying the classic 4-3-3 but with Bernardo Silva on the right wing. The Portuguese gets much more involved in the build-up phase, moving back to connect with the midfielders. 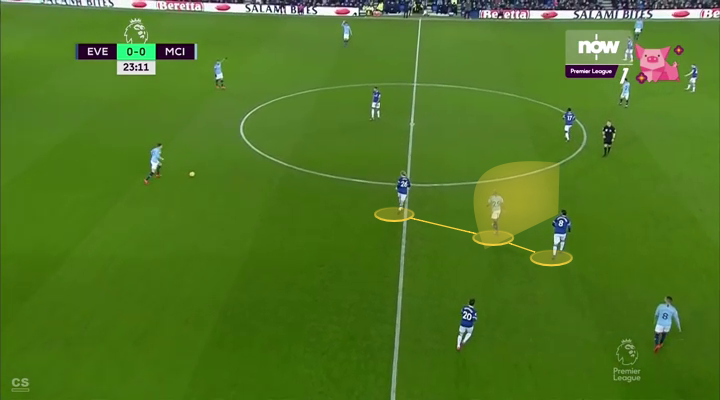 Therefore, Guardiola must have expected a similar defensive positioning by Everton, that needed more players in the middle to have numerical superiority to break Everton’s two defensive lines. On the other side, Everton started with a 4-4-1-1 that sometimes changed into a 4-1-4-1, but with a more attacking positioning on the pitch. If in their last game Everton started pressuring in their own half, in this game the pressure started closer to the final third. Dominic Calvert-Lewin pressured both centre-backs while Davies, Gueye and Andre Gomes alternated their pressure on Fernandinho. 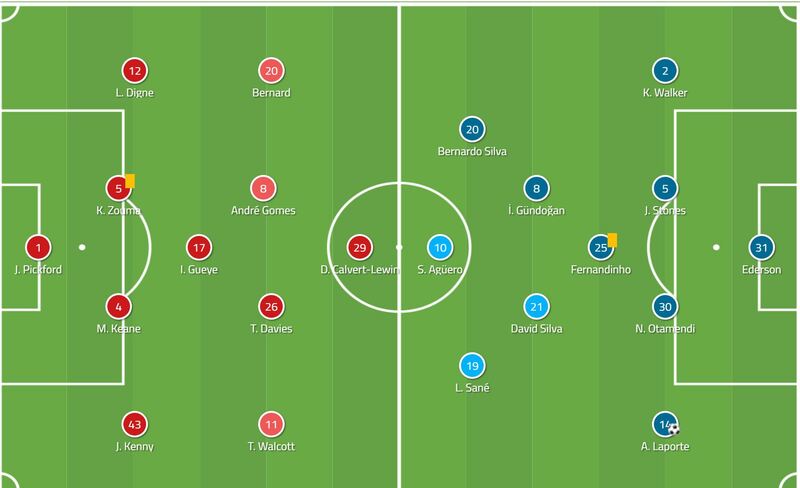 Having Bernardo Silva as a winger meant one more player in the middle, and with most Everton players stepping up higher, most of the first half action happened in the middle of the pitch. That area was so congested that the pressure at some point was too intense for the speed of the game. It also meant that Manchester City didn’t show their normal attacking potential. They were forced to try long balls, mainly to Sane, but the German was caught offside most of the time. Everton didn’t show much going forward during the first half. While Manchester City had more clear chances, they relied mostly on individual moments than collective attacks. Usually in such scenarios, those who think differently are needed to break the inertia of the game. In this match they were David Silva and Gundogan, especially after having Fernandinho well controlled by Everton’s midfielders. Silva was able to find spaces without the ball. He offered a constant passing alternative for his teammates, receiving with enough spaces to turn around and change the attacking speed of the game. Meanwhile, Gundogan’s performance has been improving a lot in the last few games. He is showing an amazing level of clarity and simplicity to his play, always finding spaces that others don’t and allowing Manchester City to open tight defences by creating chances out of nowhere with very smart passes. At this point, it is he who usuallyy directs the rhythm of the game for Manchester City. In this tight but intense game, the opening goal came in the last play of the first half from a free kick that Laporte headed into Pickford’s goal. Remember Everton had already suffered from the aerial game against Manchester City in December, and it was no different this time for the opener. The second half had mostly the same intensity we saw in the first half, but with both teams set up in a more attacking manner. This changed the game’s centre of gravity from the middle to closer to both goal areas. Even though the ball tended to be closer to the goalkeepers, this didn’t translate in clear chances, especially for Marco Silva’s team. They had only four shots during the game, and just one on target. Moreover, they had a very low xG score of 0.18, compared to an average of 0.72 of Manchester City rivals, according to Wyscout. This also compares poorly to their last game against Manchester City where they generated clear goal chances, having an xG score of 2.02 despite playing at the Etihad Stadium. With Sigurðsson replacing Andre Gomes during the second half, Everton increased their attacking capacity. Davies was used as a central midfielder as they increased their build-up capabilities further up the pitch. 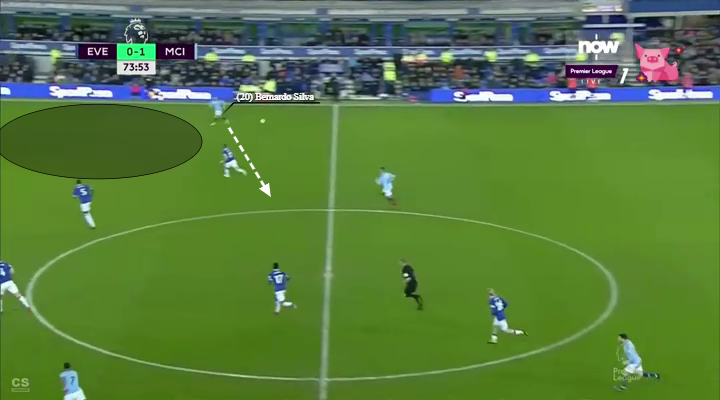 Again, this didn’t create more attacking danger for Everton, but it did change the positional organisation of Manchester City’s defence when in possession. While usually both wing-backs tend to move higher closer to Fernandinho while in possession, this time having Bernardo Silva and Sterling instead of Sane allowed those two players to receive wide but closer to the middle of the pitch. Then the two wing-backs, Laporte and Walker, formed a line of three at the back with Otamendi as Stones moved into the middle next to Fernandinho. This doubled the chances of playing out from the back through the middle, and also gave more space to Bernardo Silva and Sterling to receive wide. Substituting Sane off for Sterling made sense because they could create more attacking danger through possession, rather than looking for spaces that are usually better used by Sane with his high speed. Sterling has plenty of speed too, but is more dangerous by having the ball and dribbling at rivals. For that is easier if you receive wide and further from the wing-back marking you. Something similar happened on the right side of the attack of Manchester City. Although the team is used to using Sterling’s speed to attack that side, having the left-footed Bernardo Silva meant that usually when receiving he tended to drop inside, therefore killing the speed and dynamism of the attack. Guardiola’s decision was to keep control of the ball while attacking using less speed and more possession and precision. In the image below you can see Silva receiving a pass with plenty of space ahead, but he decides to control and move into the middle of the pitch. In any case, Manchester City didn’t have as many clear chances as we are used to seeing them create. They took advantage of Everton’s mistake trying to get the ball out of their area, and Gabriel Jesus scored in the last minute of the game after a quality pass by Kevin De Bruyne. We have seen these two teams face each other twice in the last two months, and although tactically both games were different, the conclusions were not. 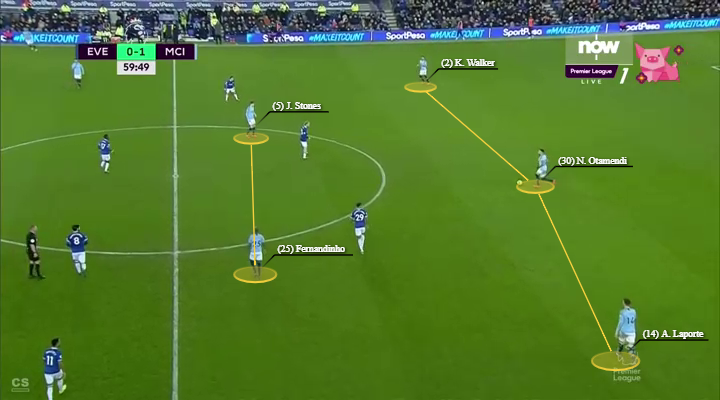 Everton were strong enough defensively this time to reduce the number of clear goalscoring chances by Manchester City, but still they committed mistakes that you can’t make against Guardiola’s team. Although in their previous game Everton had very clear goal chances – far more than this game – they weren’t able to create a lot of them.